The Buy Now link takes you to the ShareIt site, where you can purchase this product. A user name and password will be mailed to you with instructions to download the full product. All tiles are 100 x 100 pixels. Others OpenOffice, Quark Xpress, Sun StarOffice, Ulead PhotoExpress, Ulead PhotoImpact. This image shows only a fraction of the seamless textures available as part of the Background Texture Collection - all actual textures are 100 x 100 pixels and completely seamless so that you can tile them! AutoShape Fills: Use as fills in any Microsoft application that uses AutoShapes! Wallpapers: Use tiles for your desktop wallpaper - all tiles can be tiled across seamlessly. Frames: Create textured and patterned frames for digicam pictures - use them thereafter in a slideshow or post them in an online photo album. 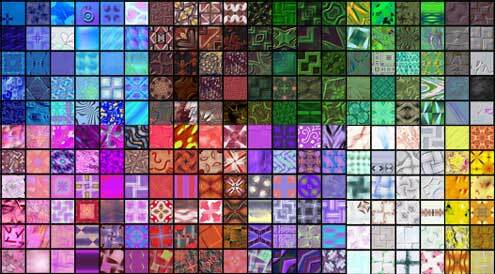 Desktop Publishing: Use these tiles to add flair to your desktop publishing projects. Montages: Merge and play with these tiles to create montages. Combine tiles and visuals. Photo Mosaics: Use as tiles for photo mosaic like effects. Texture Maps: Use as maps within your 3D, modelling or architecture application to wrap tiles around any surface. Fills: Use as fills in vector and image editing programs - such as CorelDRAW, Photoshop, Fireworks, Flash, Photo-Paint or through graphic plug-ins. Web Pages: Tile across your web page or within tables or individual cells. Clever cell and table imagery will allow you to create complex and beautiful patterns. Stationery: Use in greeting cards, posters, envelopes or gift-wrap paper. Or use within email stationery or electronic greeting cards. Slides & Screen Savers: Use in screen savers or slide show backgrounds - change backgrounds with great transitions to achieve show-stopping effects.